Fight back! Occupy Syracuse is under attack! 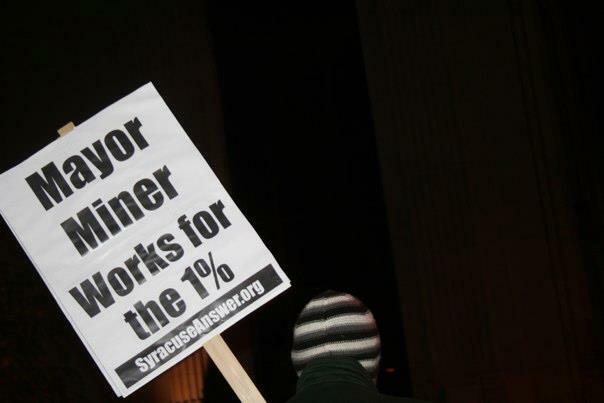 A protest sign at an Occupy Syracuse march tells the truth about the Syracuse Mayor. This morning, Syracuse Mayor Stephanie Miner personally delivered a 24-hour eviction notice to Occupy Syracuse, the protest encampment that has endured over 100 days and nights of Central New York weather in the heart of downtown. When an ANSWER Coalition organizer called the Mayor's office in protest, we were told that the city had "discovered active propane tanks" at the encampment. The Mayor's representative, who identified herself as Linsdey, said that the encampment had been given "numerous warnings that, unless the tanks were removed they would no longer be allowed to stay and, unfortunately, we are going to have to keep our word on this." Campers at the Occupy site have already complied with the requests of the city and fire department. The fire department has already confiscated several tanks, and there are currently no active propane tanks at the site; their use was brought to an immediate hault upon the warning. One camper has also reported that Miner cited safety concerns regarding the inclement weather characteristic of a Syracuse winter. Both of the reasons that the Mayor's office has cited are laughable. The Mayor does not care for the safety or well-being of struggling people in Syracuse. If she did, she would not have unilaterally closed the Ida B. Benderson Senior Center; she would not have bailed out the Chamber of Commerce to the tune of hundreds of thousands of dollars while education and other vital social services suffer from devastating budget cuts. The Mayor's actions make it crystal clear that she works only for the 1%. It was only a matter of time until she attacked the peaceful encampment. Occupy Syracuse has called for an emergency General Assembly meeting to discuss our response. The GA will be held tonight, Tuesday, Jan. 17 @ 6:30 at the encampment, on Salina St. between Fayette and Washington.